MOST authors decide what happens in the stories that they write. But Wan Nor Azriq is taking a different approach with his sixth novel, Di Kala Bulan Bermain Biola, published by Roman Buku Sdn Bhd. Di Kala Bulan Bermain Biola is one of three books which will be officially launched at MPH Nu Sentral this Saturday at 2pm. His novel takes place in a mysterious, surrealistic town called Pekan Lama. The town’s inhabitants are peculiar beings, and the place is infested with rats. Amidst all this, the unnamed narrator is searching for his lover. Wan Nor has provided many alternatives to how the story will end, and readers can slip into the shoes of the narrator and choose their own adventure. The story also gives him a chance to experiment. “[We] always put humans at the centre of our stories, and they become our main characters,” he says. But in this novel, he decided to make the town of Pekan Lama the main ‘character’, and the protagonist is just a silent observer of the world he is in. Reading the novel is almost like solving a puzzle game. “All my novels have a playful nature, and this novel is where I am most playful,” he says. Blurring the lines of what is real and what is not has always been his trademark, as seen in his previous books, D.U.B.L.I.N., Boneka Rusia Guido, Soneta Roda Basikal, Dompet Kulit Buaya, and Astronomi Bilik Mainan. “Some writers write realistically,” he says. “But there is a part of me which is still a kid, and I need something out of this world and be imaginative to create my story. If I get too serious, I do not think I can get excited and be creative. “There are two types of writers. The first type are ‘adult’ writers like Leo Tolstoy and Herman Melville, and when you read them, you learn about life. They are so wise. “The second type are ‘childlike’ writers such as Roberto Bolano and Edgar Allan Poe, and when you read them, you feel the excitement for literature. “I want people who read my works to feel excited ... I just do not know how to write something that is too ‘wise’. However, at the moment he is not working on any new novels. “Writing this novel was exhausting,” he says. When asked what is the biggest misconception that people have of him, he answers: “They think my writing is completely immoral, and I have no sense of responsibility. They believe I do not have respect for Malaysian literature. “People always assume when you write fiction, you are supposed to fight for certain issues and change the country for the better. I do not have those elements in my writing. “I believe observing life is far more important than fighting certain issues.” He is honest enough to admit his books do not always get the thumbs up from readers. 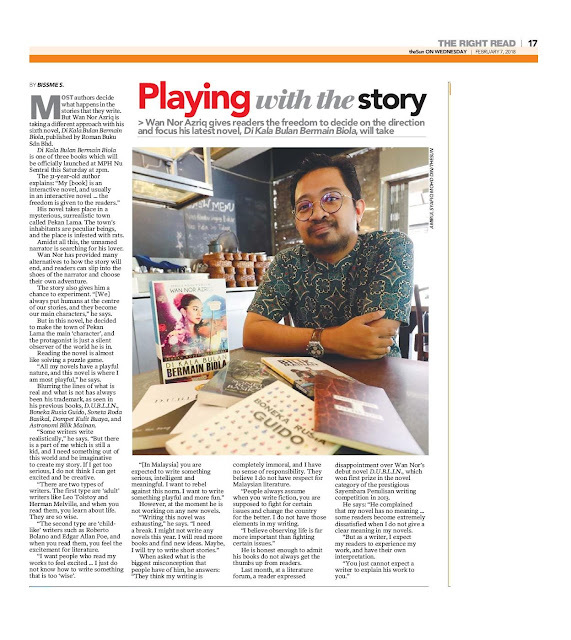 Last month, at a literature forum, a reader expressed disappointment over Wan Nor’s debut novel D.U.B.L.I.N., which won first prize in the novel category of the prestigious Sayembara Penulisan writing competition in 2013. He says: “He complained that my novel has no meaning ... some readers become extremely dissatisfied when I do not give a clear meaning in my novels.